Maps With Me Lite is an offline mapping app for mobile devices | ComTek Computer Services Inc. I do not use maps that often, usually only when I'm in a foreign country or a city that I do not know my way around in. A map was helpful when I traveled to Jerusalem for instance as I was not there before. When it comes to mapping apps that you can take with you on your smartphone, it is often a good idea to make sure that you use one that makes the maps available offline. The two main reasons for doing so are costs and speed. If you have to use the Internet to download maps, it may cost money to do so, especially if you are in a foreign country, and it may also take time before the data is downloaded to your device. A mapping app that provides you with the means to prepare everything at home, download all relevant map bits there using your Internet connection, is often helpful. The mapping apps of Microsoft and Google offer offline access but it is something that you need to request manually in the app and it is not always the most comfortable. 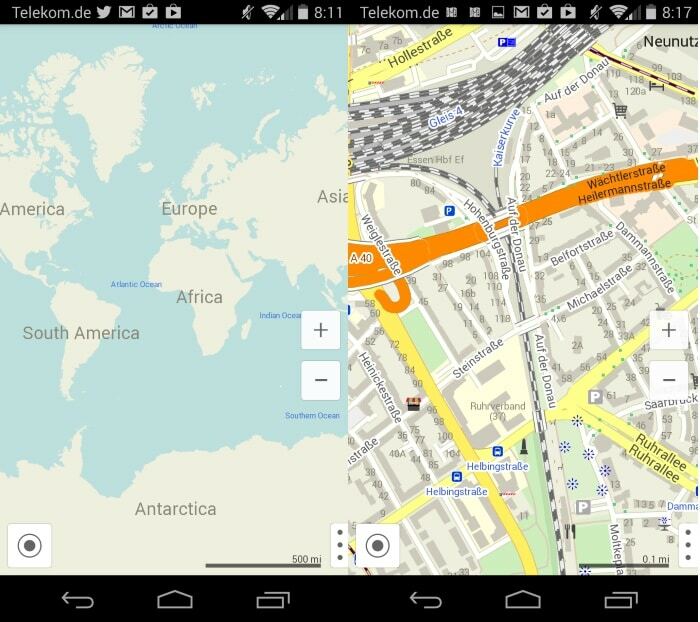 Maps With Me Lite is a free mapping application for various mobile operating systems that makes things easier. Note: You may want to open the settings and disable the sending of statistics which is enabled by default. Here you can also change the measurement units from miles to kilometers, and check the used map storage. The Android version comes as a 50 Megabyte download that brings along with it the world map but not regional maps that you may be after. To get those, you zoom in until you see a download option. Some countries are divided into multiple regions while others may not, depending on size and available. Germany is for instance divided into several regions with North-Rhine Westphalia being one of them. Instead of zooming in to download maps, it is also possible to select maps from the settings menu. Here you find listed all continents and larger areas, and then individual countries and sometimes regions, to download maps. The Israel map has a size of 20 Megabyte for instance as a single download while you will find seven downloads for the UK. England is the largest map download here with a size of more than 320 Megabyte. Once you have downloaded a map, you can use the download menu to jump straight to its location in the world. The lite version lacks two features that many may find essential. The first is access to a search. Only the pro version supports search which you may not always be able to work around. The second feature is bookmarking. It is often helpful to bookmark certain places so that you can jump to the again at a later point in time. If you compare the app to Google Maps, Here Maps or Bing Maps, you will also notice that it does not feature options to display directions among other things. With that said, if all you require is a mapping software that supports offline access, then Maps With Me may be worth a try.